A Bittersweet Finish: Please Sir, Can I Have S'more? Nothing says “summer” like a backyard campfire, singing along to the low strum of a guitar, and cracking open a can of beer. Canned beer has always had a bad reputation. The term “lawnmower beer” comes to mind: cheap swill to be drunk quickly while doing menial tasks. However, there are an increasing number of canned beers on the market from craft breweries. Why? Cans are probably the best storage option for beer. The aluminum packaging resists oxidation, chill quicker, and stay cold longer. Cans are lightweight and resist breakage, making them more suitable for outdoor activities. It’s a lot easier to pick up a few stray cans than to extract shards of glass from between blades of grass. 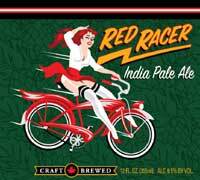 Red Racer is a craft brewery that only offers beer in cans. Their logo of a scantily clad redhead on a bicycle mirrors the pin-up models on Old Milwaukee cans. The India Pale Ale has been met with particular acclaim, and was voted the Best Beer in British Columbia award for three consecutive years. Okanagan springs offers several beers in cans, including their original lager, pale ale, and the 1516 Bavarian lager. They also make an excellent Porter, used as an ingredient in the marshmallows below. I can’t take all the credit for this week’s recipe. In fact, I can barely claim any. I had been nurturing the thought of bacon s’mores made with maple beer marshmallows for a few weeks. However, I didn’t count on someone stealing my idea. Why am I the one with a blog? The town of Gibbons is famous for two things: a prehistoric theme park with life-size dinosaur statues; and Boonstock, a three-day music festival over the Canada Day weekend. Last year some inebriated concert patrons stole into the theme park and tore the arm off of a helpless dinosaur. One of my best friends Alex was doing a security shift at the dinosaur park to ensure history did not repeat itself. What better way to spend a night shift than making toasting homemade marshmallows – maple porter marshmallows. With candied bacon. Naturally, I asked if she could save me a few. She took it one step further. I came home late after the Canada Day celebrations to a brown paper bag hanging on the doorknob. Not only had she made two types of marshmallows, she had made a batch of chocolate-dipped graham crackers from scratch. Both the marshmallows and crackers were cut in the shape of maple leaves, to celebrate the birth of our country. Also in the bag was a piece of candied bacon to complete the s’more. And the empty Porter bottle for reference. The construction of the ultimate s’more may be common sense to most, but some unfortunate city folk may have never experienced this sacred campfire ritual. To construct the ultimate s’more, toast marshmallows over an open fire. When lightly browned, make a sandwich of the marshmallow, a square of chocolate, and a piece of candied bacon between two graham crackers. If you have a slightly less awesome best friend (which is extremely probable) or you don’t feel like making the graham crackers, use normal ones with Lindt sea salt dark chocolate. The marshmallows are excellent with or without the candied bacon pieces. Candied bacon is no longer an optional s'more component. Next level marshmallows - even shaped like maple leaves! Start by making the candied bacon. Preheat your oven to 350°F and place a rack in the center of the oven. Combine light brown sugar and 1/8 teaspoon cinnamon on a plate, using your hands to mix. Rub each slice of bacon with cinnamon sugar until evenly coated. Lay strips of bacon on a cooling rack set over a baking sheet. Bake for 30 to 35 minutes until deeply caramelized. Let cool then finely chop. Measure out 1/2 cup (1 1/2 oz.) for the marshmallows and set aside. Save remainder for snacking. Lightly coat a 8 by 8 inch baking pan with cooking spray. Use a paper towel to wipe away any excess spray. Combine gelatin and beer in a small bowl, whisking to combine. Let stand for at least 5 minutes. In a medium saucepan, combine white sugar, maple syrup, corn syrup, beer and sea salt, stirring to combine. Bring to a boil over high heat, stirring occasionally. Continue to boil until the mixture reaches 240°F. If the mixture starts to bubble up too much, lower the heat. Once the mixture reaches 240°F, take it off the heat. Microwave the gelatin on high for 30 seconds. Pour into the bowl of a stand mixer fitted with the whisk attachment. Whisk on low for a moment then slowly pour in the hot syrup mixture. Increase the speed to medium (number six on my mixer) and beat for 5 minutes. Increase the speed to medium-high (number eight) and beat for 3 minutes. Add 1/8 teaspoon cinnamon then beat on the highest speed possible (number ten) for 1 minute. Using a silicon spatula, quickly fold in the candied bacon bits. Pour the marshmallow into the prepared pan and smooth out the top. In a small bowl, combine confectioner’s sugar and corn starch, whisking to combine. Sift a few spoonfuls of the sugar-starch mixture evenly over the marshmallow. Set aside the rest of the sugar-starch mixture to use once the marshmallows are cut. Let the marshmallow set for at least 6 hours in a cool, dry place. Run a sharp knife along the edges of the pan to release the marshmallow. Invert onto a cutting board. Use a cookie cutter to cut out shapes from the slab and set over the bowl containing the sugar-starch mixture. Sprinkle with the pieces with the mixture then use your hands to toss. Repeated until marshmallows are evenly coated. Tape down a large square of parchment paper onto your counter using a sturdy tape (I used packing tape around all four sides) and line a cookie pan with parchment paper, set aside. In a medium-sized mixing bowl, combine whole wheat flour, cinnamon, baking soda, and salt. Whisk and set aside. In a small bowl, stir together honey, molasses, applesauce, oil, milk, and vanilla. Pour this over the dry ingredients and stir. Sprinkle some of the barley flour onto the mixture and mix in using your fingers. Do this until the mixture can form a kneadable ball. Dust the parchment paper square with the barley flour and knead the dough, adding more flour when needed. Once you form a ball, let the dough sit for 10 minutes. Heat the oven to 350 or 375°F. Roll the dough using a rolling pin to about 1/8" thick, sprinkling with flour if needed. Slice crackers using a pizza cutter and use a spatula to lift each square onto the prepared pan about 2 inches apart. Poke holes into the crackers using a fork, then bake for 14-16 minutes at 350 °F, or 10-12 minutes at 375°F. Note: Baking time depends on size of crackers. Keep watch and remove crackers from oven when the edges have browned.